The cash hunt in San Francisco continues as an anonymous millionaire plans to keep hiding money throughout the city indefinitely. SAN FRANCISCO (KGO) -- The cash hunt in San Francisco continues as an anonymous millionaire plans to keep hiding money throughout the city indefinitely. White envelopes containing about $4,000 in cash have been found since Thursday night. Alexzandra Etherton was across the street when she saw a tweet from the account @hiddencash and recognized the 9th Circuit Court of Appeals building. She ran to find an envelope taped to a parking meter. "There was $60 in 20's and then about four just $2 bills," Etherton said. She's part of a growing club of people who've found cash in envelopes by following the clues. "We got the tweet saying go to the caterpillar by the water," Matthew Burkert said. "My first thought was Caterpillar construction equipment." A friend knew about a bulldozer beached along the Great Highway. So did somebody else -- Burkert had to race him. "He went up the front side of the Caterpillar, I went up the back side, and it just happened to be on the back side," Burkert said. As ABC7 News was talking with Burkert, another clue was tweeted - a cartoon of a little chef and a beach. We arrived at Baker Beach just as Forrest Hanson found the cash. It all leaves people asking -- why? Running after money could easily inspire greed, but this seems to have inspired generosity. 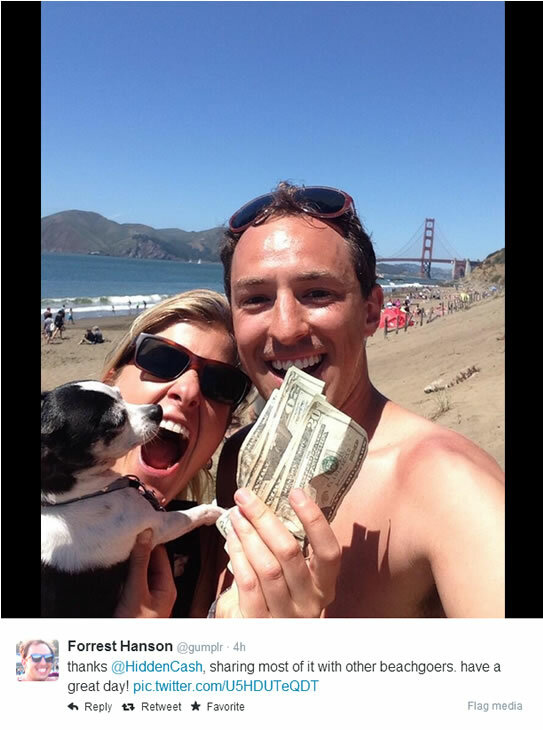 Within five minutes of finding the prize, Hanson gave all the money away to families on the beach. Burkert says he, too, wants to pay it forward. "Giving it out to people on the street, I don't know; but definitely not going to use it for myself," he said. In an anonymous phone interview, the man behind hidden cash says that's the point. "I'm in that 1 percent that some people loathe, but rather than hating people who are successful, my point would be to encourage people who have been successful to give back a little bit more," he said. One person did keep the cash. "I'm a writer, and I don't make that much money," said Etherton, who publishes books under the pen name A.N. Irvano. Irvano bought copies her own books with the money, hoping to sell them and help launch her career. "I would've gotten on my knees and thanked them," Etherton said when asked what she would do if she met the person who left the cash.